Are you looking for a cooking smoker used to make true barbecue as well as foods like pastrami and smoked turkey? These hot smokers come in many shapes and sizes and can be powered by a wide range of fuels. Here is what to consider when you start shopping for a smoker. Smokers can be had for as little as $50 and up to $10,000 or more. If you aren't going to use it heavily, you may want to start with a small vertical water smoker. These are the least expensive smokers you can buy. You can make good barbecue in these smokers, and for many people, it is the only smoker they need, but there is a lot more to smokers than these simple units. Charcoal and wood smokers are more traditional and typically provide a more authentic flavor to your cooking. The cheapest smokers on the market are usually charcoal, but some of the most expensive use charcoal as well. Electric smokers are the most convenient, but many lack authentic flavor. Computer-controlled electric smokers allow you to set up the smoker and let it run until the food is ready (like the Cookshack Amerique). Pellet smokers (like the Traeger Lil' Texas) are electrically powered but burn wood pellets to provide heat and smoke. These units can be as convenient as an electric smoker, but give you the flavor of the best charcoal/hardwood smokers. Propane smokers typically heat faster and easier than electric smokers but are still easy to use. Depending on the price you can get a smoker that gives great barbecue with very little effort. One question you want to answer is how involved do you want to be in the process. Barbecue is a long and noble tradition of people sitting by the fire making great food. Do you want to set it and forget it or do you want to take an active part in the food you cook? Look for the electronic or computer control features that may automate some of the processes for you. The smallest smokers can produce enough food for a large family (maybe as many as 20 people). 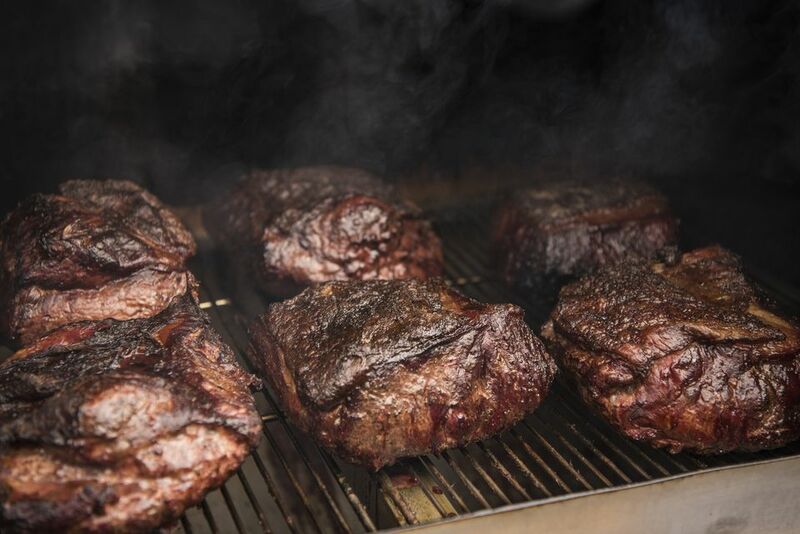 The largest smokers make enough barbecue to cater a party all day long. It is important that you consider how much barbecue you want to make before you buy. If you are only going to be smoking for the family on the weekend, then a small unit will be enough. If you want to be able to smoke for the company party, then you will need a lot more space. Most smokers will tell you how much food you can prepare. As a general rule of thumb, you need one pound of meat (raw) per person. That can mean a lot of food. There are a number of units on the market that can smoke and grill. If you want to be able to have the best of both worlds, then these are the units for you. Charcoal units, like the Big Green Egg, are the most common of this kind of multipurpose smoker. While many of the lower priced units will promise this feature, you must be aware that take a great design to be both a good smoker and a good grill. Most of the less expensive models do one or the other well, but not both. While you may not recognize the names stamped on many smokers, you should look into the company that produces the smoker you want to buy. There are a number of generic units that are store brands. These units offer no future of service or support. When you find a smoker that looks good to you, research the smoker reviews from experts and users. MasterBuilt 30-Inch Electric Smokehouse: Is It Enough? What Is A Barbecue Smoker?